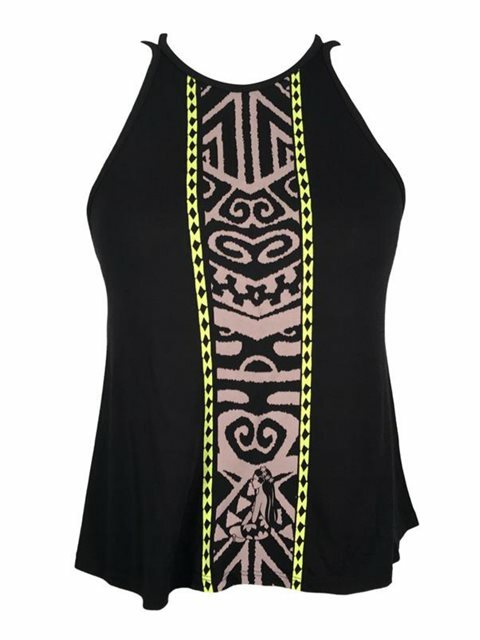 The Hinano Tepora top has a screen printed tribal detail at the front with a high neckline. It has a strappy crossed detail at the back with the Hinano gold emblem. The Hinano Tahiti clothing brand was founded in Tahiti and exemplifies a deep love for the Polynesian island life style. Hinano's beautiful Vahine logo, which displays the traditional pareo and tiare flower in her hair is renowned around the world. Sizes may vary slightly in finished garments based on fabric and style. All measurements are in inches.